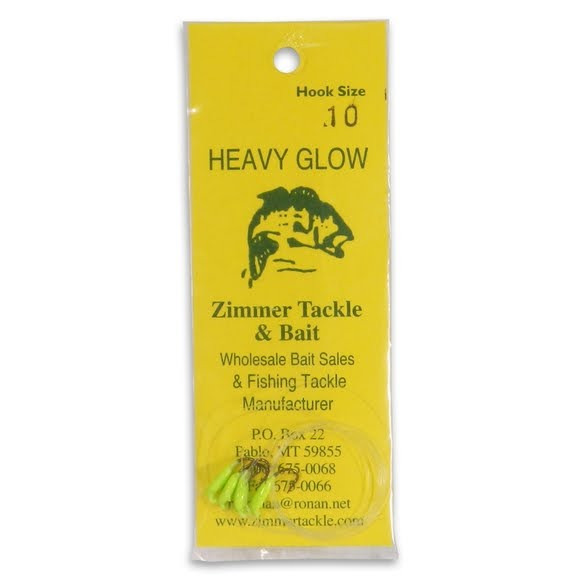 Zimmer Tackle's lead-bodied glow hook is more trouble free than composite bodied glow hooks when fished below a heavy attractor. The 18" leaders are made from relatively stiff abrasive resistant Ande's line. They are tied so the the hook sits horizontal which gtives the lure a more natural appearance and improves the point-penetrating angle so fewer fish are lost. Zimmer Tackle &apos;s lead-bodied glow hook is more trouble free than composite bodied glow hooks when fished below a heavy attractor. The 18" leaders are made from relatively stiff abrasive resistant Ande&apos;s line. They are tied so the the hook sits horizontal which gtives the lure a more natural appearance and improves the point-penetrating angle so fewer fish are lost. The leader&apos;s diameter are graduated according to hook size.